In the latest Lesson #10 of my Embedded C Programming with ARM Cortex-M Video Course I explain what stack overflow is and I show what can transpire deep inside an embedded microcontroller when the stack pointer register (SP) goes out of bounds. You can watch the YouTube video to see the details, but basically when the stack overflows, memory beyond the stack bound gets corrupted and your code will eventually fail. If you are lucky, your program will crash quickly. If you are less lucky, however, your program will limp along in some crippled state, not quite dead but not fully functional either. Code like this can kill people. Unless you’ve been living under a rock for a past couple of years, you must have heard of the Toyota unintended acceleration (UA) cases, where Camry and other Toyota vehicles accelerated unexpectedly and some of them managed to kill people and all of them scared the hell out of their drivers. The recent trial testimony delivered at the Oklahoma trial by an embedded guru Michael Barr for the fist time in history of these trials offers a glimpse into the Toyota throttle control software. In his deposition, Michael explains how a stack overflow could corrupt the critical variables of the operating system (OSEK in this case), because they were located in memory adjacent to the top of the stack. 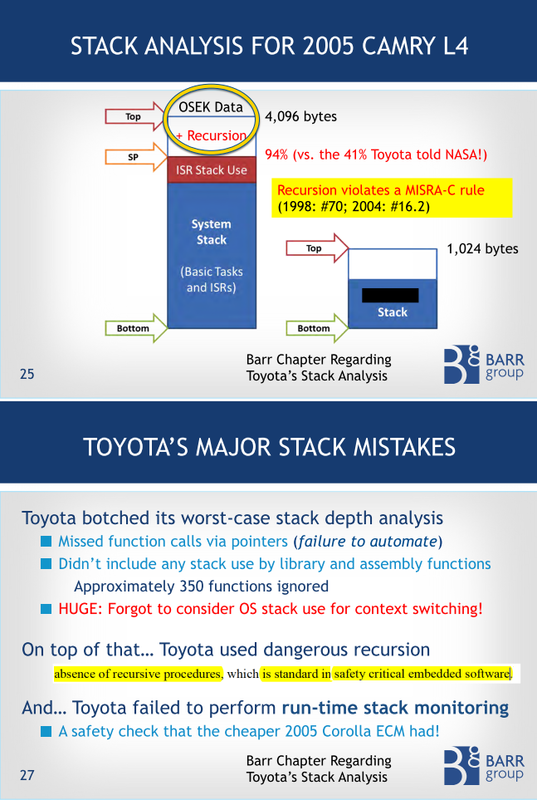 The following two slides from Michael’s testimony explain the memory layout around the stack and why stack overflow was likely in the Toyota code (see the complete set of Michael’s slides). The crucial aspect in the failure scenario described by Michael is that the stack overflow did not cause an immediate system failure. In fact, an immediate system failure followed by a reset would have saved lives, because Michael explains that even at 60 Mph, a complete CPU reset would have occurred within just 11 feet of vehicle’s travel. Instead, the problem was exactly that the system kept running after the stack overflow. But due to the memory corruption some tasks got “killed” (or “forgotten”) by the OSEK real-time operating system while other tasks were still running. This, in turn, caused the engine to run, but with the throttle “stuck” in the wide-open position, because the “kitchen-sink” TaskX, as Michael calls it, which controlled the throttle among many other things, was dead. The data corruption caused by the stack overflow is completely self inflicted. I mean, we know exactly which way the stack grows on any given CPU architecture. For example, on the V850 CPU used in the Toyota engine control module (ECM) the stack grows towards the lower memory addresses, which is traditionally called a “descending stack” or a stack growing “down”. 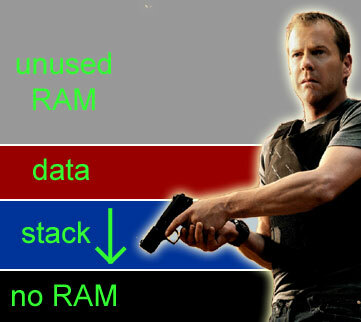 In this sense the stack is like a loaded gun that points either up or down in the RAM address space. Placing your foot (or your critical data for that matter) exactly at the muzzle of this gun doesn’t sound very smart, does it? In fact, doing so goes squarely against the very first NRA Gun Safety Rule: “ ALWAYS keep the gun pointed in a safe direction”. A standard memory map, in which the stack grows towards your program data. Yet, as illustrated in the Figure above, most traditional, beaten path memory layouts allocate the stack space above the data sections in RAM, even though the stack grows “down” (towards the lower memory addresses) in most embedded processors (see Table below ). This arrangement puts your program data in the path of destruction of a stack overflow. In other words, you violate the first NRA Gun Safety Rule and you end up shooting yourself in the foot, as did Toyota. At this point, I hope it makes sense to suggest that you consider pointing the stack in a safe direction. For a CPU with the stack growing “down” this means that you should place the stack at the start of RAM, below all the data sections. As illustrated in the Figure below, that way you will make sure that a stack overflow can’t corrupt anything. A safer memory map, where a stack overflow can't corrupt the data. 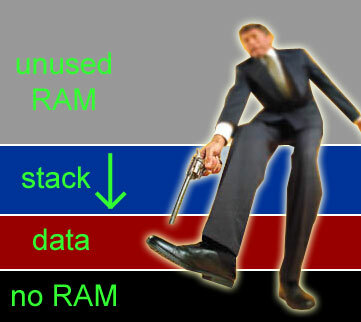 Of course, a simple reordering of sections in RAM does nothing to actually prevent a stack overflow, in the same way as pointing a gun to the ground does not prevent the gun from firing. Stack overflow prevention is an entirely different issue that requires a careful software design and a thorough stack usage analysis to size the stack adequately. But the reordering of sections in RAM helps in two ways. First, you play safe by protecting the data from corruption by the stack. Second, on many systems you also get an instantaneous and free stack overflow detection in form of a hardware exception triggered in the CPU. For example, on ARM Cortex-M an attempt to read to or write from an address below the beginning of RAM causes the Hard Fault exception. Later in the article I will show how to design the exception handler to avoid shooting yourself in the foot again. But before I do this, let me first explain how to change the order of sections in RAM. As I mentioned earlier, an overflow of a descending stack placed at the start of RAM causes the Hard Fault exception on an ARM Cortex-M microcontroller. This is exactly what you want, because the exception handler provides you the last line of defense to perform damage control. However, you must be very careful how you write the exception handler, because your stack pointer (SP) is out of bounds at this point and any attempt to use the stack will fail and cause another Hard Fault exception. I hope you can see how this would lead to an endless cycle that would lock up the machine even before you had a chance to do any damage control. In other words, you must be careful here not to shoot yourself in the foot again. Please note how the __attribute__((naked)) extension is applied to the declaration of the HardFault_Handler() function. The function definition is written entirely in assembly. It starts with moving the SP register into R0 and tests whether it is in bound. A one-sided check against __stack_start__ is sufficient, because you know that the stack grows “down” in this case. If a stack overflow is detected, the SP is restored back to the original end of the stack section __stack_end__. At this point the stack pointer is repaired and you can call a standard C function. Here, I call the function assert_failed(), commonly used to handle failing assertions. assert_failed() can be a standard C function, but it should not return. Its job is to perform application-specific fail-safe shutdown and logging of the error followed typically by a system reset. The code downloads accompanying this article provide an example of assert_failed() implementation in the board support package (BSP). On a side note, I’d like to warn you against coding any exception handler as an endless loop, which is another beaten path approach taken in most startup code examples provided by microcontroller vendors. Such code locks up the machine, which might be useful during debugging, but is almost never what you want in the production code. Unfortunately, all too often I see developers shooting themselves in the foot yet again by leaving this dangerous code in the final product. The technique of placing the stack at the start of RAM is not going to work if you use an RTOS kernel that requires a separate stack for every task. In this case, you simply cannot align all these multiple stacks at the single address in RAM. But even for multiple stacks, I would recommend taking a minute to think about the safest placement of the stacks in RAM as opposed to allocating the stacks statically inside the code and leaving it completely up to the linker to place the stacks somewhere in the .bss section. Finally, I would like to point out that preemptive multitasking is also possible with a single-stack kernel, for which the simple technique of aligning the stack at the start of RAM works very well. Contrary to many misconceptions, single-stack preemptive kernels are quite popular. For example, the so called basic tasks of the OSEK-VDX standard all nest on a single stack, and therefore Toyota had to deal with only one stack (see Barr’s slides at the beginning). For more information about single-stack preemptive kernels, please refer to my article “Build a Super-Simple Tasker”. The most important strategy to deal with rare, but catastrophic faults, such as stack overflow is that you need to carefully design and actually test your system’s response to such faults. However, typically you cannot just wait for a rare fault to happen by itself. Instead, you need to use a technique called scientifically fault injection, which simply means that you need to intentionally cause the fault (you need to fire the gun!). In case of stack overflow you have several options: you might intentionally reduce the size of the stack section so that it is too small. You can also use the debugger to change the SP register manually. From there, I recommend that you single -step through the code in the debugger and verify that the system behaves as you intended. Chances are that you might be shooting yourself in the foot, just as it happened to Toyota. I would be very interested to hear what you find out. Is your stack placed above the data section? Are your exception handlers coded as endless loops? Please leave a comment! The insanely popular ARM Cortex-M processor offers very versatile interrupt priority management, but unfortunately, the multiple priority numbering conventions used in managing the interrupt priorities are often counter-intuitive, inconsistent, and confusing, which can lead to bugs. In this post I attempt to explain the subject and cut through the confusion. The most important fact to know is that ARM Cortex-M uses the “reversed” priority numbering scheme for interrupts, where priority zero corresponds to the highest urgency interrupt and higher numerical values of priority correspond to lower urgency. This numbering scheme poses a constant threat of confusion, because any use of the terms “higher priority” or “lower priority” immediately requires clarification, whether they represent the numerical value of priority, or perhaps, the urgency of an interrupt. NOTE: To avoid this confusion, in the rest of this post, the term “priority” means the numerical value of interrupt priority in the ARM Cortex-M convention. The term “urgency” means the capability of an interrupt to preempt other interrupts. A higher-urgency interrupt (lower priority number) can preempt a lower-urgency interrupt (higher priority number). The number of priority levels in the ARM Cortex-M core is configurable, meaning that various silicon vendors can implement different number of priority bits in their chips. However, there is a minimum number of interrupt priority bits that need to be implemented, which is 2 bits in ARM Cortex-M0/M0+ and 3 bits in ARM Cortex-M3/M4. But here again, the most confusing fact is that the priority bits are implemented in the most-significant bits of the priority configuration registers in the NVIC (Nested Vectored Interrupt Controller). The following figure illustrates the bit assignment in a priority configuration register for 3-bit implementation (part A), such as TI Tiva MCUs, and 4-bit implementation (part B), such as the NXP LPC17xx ARM Cortex-M3 MCUs. The relevance of the bit representation in the NVIC priority register is that this creates another priority numbering scheme, in which the numerical value of the priority is shifted to the left by the number of unimplemented priority bits. If you ever write directly to the priority registers in the NVIC, you must remember to use this convention. NOTE: The interrupt priorities don’t need to be uniquely assigned, so it is perfectly legal to assign the same interrupt priority to many interrupts in the system. That means that your application can service many more interrupts than the number of interrupt priority levels. NOTE: Out of reset, all interrupts and exceptions with configurable priority have the same default priority of zero. This priority number represents the highest-possible interrupt urgency. The Cortex Microcontroller Software Interface Standard (CMSIS) provided by ARM Ltd. is the recommended way of programming Cortex-M microcontrollers in a portable way. The CMSIS standard provides the function NVIC_SetPriority(IRQn, priority) for setting the interrupts priorities. However, it is very important to note that the ‘priority‘ argument of this function must not be shifted by the number of unimplemented bits, because the function performs the shifting by (8 – __NVIC_PRIO_BITS) internally, before writing the value to the appropriate priority configuration register in the NVIC. The number of implemented priority bits __NVIC_PRIO_BITS is defined in CMSIS for each ARM Cortex-M device. For example, calling NVIC_SetPriority(7, 6) will set the priority configuration register corresponding to IRQ#7 to 1100,0000 binary on ARM Cortex-M with 3-bits of interrupt priority and it will set the same register to 0110,0000 binary on ARM Cortex-M with 4-bits of priority. NOTE: The confusion about the priority numbering scheme used in the NVIC_SetPriority() is further promulgated by various code examples on the Internet and even in reputable books. For example the book “The Definitive Guide to ARM Cortex-M3, Second Edition”, ISBN 979-0-12-382091-4, Section 8.3 on page 138 includes a call NVIC_SetPriority(7, 0xC0) with the intent to set priority of IR#7 to 6. This call is incorrect and at least in CMSIS version 3.x will set the priority of IR#7 to zero. The interrupt priority registers for each interrupt is further divided into two parts. The upper part (most-significant bits) is the preempt priority, and the lower part (least-significant bits) is the subpriority. The number of bits in each part of the priority registers is configurable via the Application Interrupt and Reset Control Register (AIRC, at address 0xE000ED0C). The preempt priority level defines whether an interrupt can be serviced when the processor is already running another interrupt handler. In other words, preempt priority determines if one interrupt can preempt another. The subpriority level value is used only when two exceptions with the same preempt priority level are pending (because interrupts are disabled, for example). When the interrupts are re-enabled, the exception with the lower subpriority (higher urgency) will be handled first. In most applications, I would highly recommended to assign all the interrupt priority bits to the preempt priority group, leaving no priority bits as subpriority bits, which is the default setting out of reset. Any other configuration complicates the otherwise direct relationship between the interrupt priority number and interrupt urgency. NOTE: Some third-party code libraries (e.g., the STM32 driver library) change the priority grouping configuration to non-standard. Therefore, it is highly recommended to explicitly re-set the priority grouping to the default by calling the CMSIS function NVIC_SetPriorityGrouping(0U) after initializing such external libraries. Often in real-time embedded programming it is necessary to perform certain operations atomically to prevent data corruption. The simplest way to achieve the atomicity is to briefly disable and re-enabe interrupts. The ARM Cortex-M offers two methods of disabling and re-enabling interrupts. The simplest method is to set and clear the interrupt bit in the PRIMASK register. Specifically, disabling interrupts can be achieved with the “CPSID i” instruction and enabling interrupts with the “CPSIE i” instruction. This method is simple and fast, but it disables all interrupt levels indiscriminately. This is the only method available in the ARMv6-M architecture (Cortex-M0/M0+). The CMSIS provides the function __set_BASEPRI(priority) for changing the value of the BASEPRI register. The function uses the hardware convention for the ‘priority’ argument, which means that the priority must be shifted left by the number of unimplemented bits (8 – __NVIC_PRIO_BITS). NOTE: The priority numbering convention used in __set_BASEPRI(priority) is thus different than in the NVIC_SetPriority(priority) function, which expects the “priority” argument not shifted. When developing embedded code for devices with non-trivial user interfaces, it often pays off to build a prototype (virtual prototype) of the embedded system of a PC. The strategy is called “dual targeting”, because you develop software on one machine (e.g., Windows PC) and run it on a deeply embedded target, as well as on the PC. Dual targeting is the main strategy for avoiding the “target system bottleneck” in the agile embedded software development, popularized in the book “Test-Driven Development for Embedded C” by James Grenning. Dual targeting can have many different objectives. For example, in the test-driven development (TDD) of embedded software, the objective is to build relatively concise unit tests and execute them on the desktop as console-type applications. The main challenge is management of the inter-module dependencies and flexibility of tests, but the overall architecture of the final product is of lesser concerns, as the unit tests are executed in isolation using special test harnesses. When developing embedded code for devices with non-trivial user interfaces, one often runs into the problem of representing the embedded front panels as GUI elements on the PC. The problem is so common, that I’m really surprised that my internet search couldn’t uncover any simple C-only interface to the basic elements, such as LCDs, buttons, and LEDs. I’ve posted questions on StackOverflow, and other such forums, but again, I got recommendations for .NET, C#, VisualBasic, and many expensive proprietary tools, none of which provided an easy, direct binding to C. My objective is not really that complicated, yet it seems that every embedded developer has to re-invent this wheel over and over again. Graphic display for an efficient, pixel-addressable displays such as graphical LCDs, OLEDs, etc. with full 24-bit color. Segment display for segmented display such as segment LCDs, and segment LEDs with generic, custom bitmaps for the segments. The toolkit comes with an example and an App Note, showing how to handle input from the owner-drawn buttons, regular buttons, keyboard, and the mouse. You can also view a 1-minute YouTube video “Flyn ‘n’ Shoot game on windows” that shows a virtual embedded board running a game. Regarding the size and complexity of the “QWIN GUI Toolkit“, the implementation of the aforementioned GUI elements takes only about 250 lines of C. The example with all sources of input and a lot of comments amounts to some 300 lines of C. The toolkit has been tested with the free MinGW compiler, the free Visual C++ Express 2013, and the free ResEdit resource editor. As part of my New Year’s resolution for 2013, I just started to teach an Embedded C Programming Course with ARM Cortex-M on YouTube. The playlist for this course is available at: http://www.youtube.com/playlist?list=PLPW8O6W-1chwyTzI3BHwBLbGQoPFxPAPM . The course is intended for beginners and is structured as a series of short, focused, hands-on lessons that teach you how to program ARM Cortex-M microcontrollers in C.
I’ve designed this course not just to be watched, but to follow it along on your own computer. In the “Getting Started” Lesson 0, I show you how to download and install the free evaluation version of IAR EWARM and how to order the Stellaris Launchpad ARM Cortex-M4 board (for just $12.99). The board is optional, as I show how to use the instruction set simulator. My goal is not just to teach C–other courses do it already quite well. But there are virtually no courses that would step down to the machine level and show you exactly what happens inside the ARM processor. Starting from Lesson 1 you actually see how the ARM Cortex-M processor executes your code, how it manipulates registers, and how it counts. You learn how binary numbers map to the hexadecimal system used in the debugger (and in C) and you learn about the two’s complement number representation of signed numbers. In lesson 2, you learn about the flow of control and the ARM branch instructions. Actually, you witness a disection of the ARM B-instruction (branch). You also learn about the pipeline and pipeline stalls due to branching. In lesson 3, you learn about variables and pointers. You learn how ARM accesses variables in memory through the load and store instructions (load-store architecture). You also learn how the fundamental concept of memory addresses maps to pointers in C, how to obtain an address of a variable and how to dereference a pointer. I hope that this course will help you gain understanding of the ARM Cortex-M core, which will look really good on your resume. This deeper understanding will allow you to use both the ARM processor and the C language more efficiently and with greater confidence. You will gain understanding not just what for your program does, but also how the C statements translate to machine instructions and how fast the processor can execute them. Christmas is right around the corner and if you wonder about the presents, I have just an idea for you. No, it is not the new iPad, Galaxy S3 phone, or any of the new “ultrabooks”. In fact, this is exactly the opposite. My present idea is to boost your productivity in creating “content”, not merely consuming it. And when it comes to creating anything with a computer, you need a big screen–the bigger the better. In fact, I’d recommend that you get yourself two new monitors. And don’t think small. How about two 27″, 1920x1080p full HD, LED-lit panes? You can get those for under $300 each, so a pair will still cost you less than a new iPad. I got such a setup a few months ago, and now I’m absolutely convinced that this has been the best investment in my productivity–better than a faster CPU or a solid-state disk. I really can’t benefit from my machine being faster–that’s not what wastes my time. 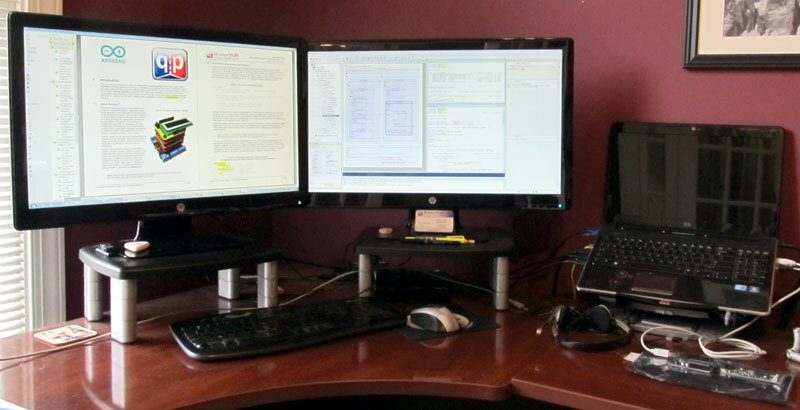 But I sure can use more screen, to read the documentation two pages at a time, and to see a complete IDE or a modeling tool on the other screen (modeling tools absolutely love big screens!). The picture of my desk shows my setup. I have two 27″ HP 2711x 1080p monitors connected to an HP dv6 laptop. One monitor is connected via the HDMI cable and the other via the analog VGI cable. I don’t see any degradation in image quality on the VGA-driven monitor.